Nates Mineshaft runs away with the Lone Star Park Handicap this Memorial Day weekend, winning the race easily by 7 and 1/4 lengths. Lone Star Park was a scorcher Monday for Memorial Day, but it provided for a great day of racing and fun. Temperatures climbed up towards the triple digit mark, but that didn’t prevent the festivities that were taking place at the park. Besides the main attraction, Lone Star was offering a live band playing music from all genres, the food truck festival serving the best of quick dining, and WinStar’s “Win A Million” day. Making the quick drive from Austin to Grand Prairie, we arrived at Lone Star Park with a couple minutes to spare before the first race and decided to take a tour of the park. We went to the media lounge, the infield, the food trucks (of course), and the stage to see the band, all with time to spare to make a wager on race 2. With the temperature blazing and the sun glaring, the indoor media lounge seemed to be the best place to spend most of the day taking in the action. There were some very close finishes in the under-card, drawing ohhhh’s and ahhhh’s from the crowd as the official results were announced. It seemed like race after race the leader and pace setter was going to have enough left to finish out the race in the lead, but the final stretch proved to be just a furlong too far. I found myself not wagering on every race, but rather just predicting a winner. The races on the main track dirt would have left me a rich man leaving the park, while the grass wouldn’t have treated me as kindly. 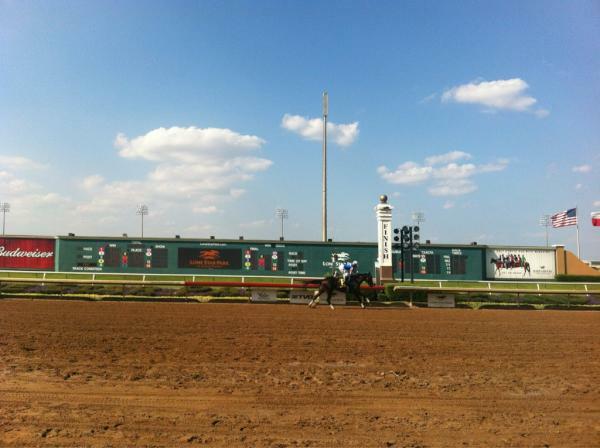 Race 9, the Lone Star Park Handicap (G3) was the only stakes race of the day, and the main attraction of the racing. Nates Mineshaft (pictured above) was the clear favorite in the race, and seemed to trot out onto the track with an air of confidence. At 8-5, Nates Mineshaft didn’t disappoint winning the Handicap by an easy 7 1/4 lengths. He busted out of the gates and carried the lead for the entire race, setting a steady pace that allowed for his late surge and easy victory. In winner’s circle he seemed calm and collected. The race was 1 and 1/16th mile, yet didn’t leave Nates Mineshaft panting too hard. I would expect to see more wins out of this confident 5 year old. The park had a decent amount of people there, but not overcrowded which was very nice. Because there were so many attractions at the park, people were spread out all around the grounds. The food trucks were a great addition, if I may say so myself, that helped to provide an amusing atmosphere. Between the band jamming Bob Marley and AC/DC, the food trucks serving banh mi and sliders, the million dollar giveaway, and the photo-finish racing, Lone Star Park served as a very rewarding way to spend this Memorial Day.